On Sunday, September 24, 1899, police stopped the funeral procession of 29-year-old Mary Kakacek. Her body was taken for an autopsy. The coroner's jury concluded that Mary's death in her home the previous day had been due to a criminal abortion perpetrated by midwife Annie Stanek. Mary's use of a midwife was typical of Chicago illegal abortions of the era, that were frequently perpetrated by medical professionals. During her final illness, Mary had made a dying statement telling of her visits to Stanek, stating that she was treated harshly by the midwife. Stanek was held without bail by the Coroner's Jury. On September 23, 1907, 27-year-old homemaker Mabel Brock of Lake Station, Indiana, died in Chicago's John Streeter Hospital. The coroner's jury determined that she had died from an abortion perpetrated by midwife Mrs. Lobbie from Hobart, Indiana on September 5. On Monday, September 23, 1912, the body of Anna "Annie" Rice was taken from the Chicago home of Dr. Maximillian Meinhardt to the undertaking establishment of E. I. Harty. Dr. Henry G. W. Reinshardt, the deputy coroner, went to Harty's business, saw Annie's body on the slab, and questioned Harty. He learned that the death certificate said that the young woman had died of pneumonia, but that her body showed signs of trauma. .Reinhardt considered this fishy and performed an autopsy. He was able to determine that Annie had died of abortion complications, but was unable to determine from examination of the body if the abortion had been self-inflicted or perpetrated by somebody else. Another deputy coroner, David G. Gillespie, convened a coroner's jury to investigate the circumstances of the fatal abortion. He found out that Annie had gone to Meinhardt's home the previous Saturday. Meinhardt said that she was already seriously ill and he provided care for her because she refused to go to a hospital. Annie's friends and relatives, however, said she'd been in good health when they'd seen her last. On Monday morning, Annie was so sick that Meinhardt overrode her wishes and summoned an ambulance. Annie collapsed and died right as the ambulance was pulling up. After tracking down her relatives, he said, he'd sent the body to the undertaker of their choice. Meinhardt insisted, even after the autopsy, that the young woman had died of heart failure and pneumonia. So far I've been unable to determine the outcome of the case. Meinhard went on to be embroiled in the August 1915 abortion death of Stella Cams at his Lake Shore Hospital and the 1917 abortion death of Emma Melvin. Stella Cams, age 30, died on August 2, 1915. at Chicago's Lake Shore Hospital. She had been admitted under the name "Mrs. Steele." She had been sick since July. On the 17th, her husband, Harry Cams, called Dr. Thomas J. Balhatchett to attend to his wife. Balhatchett declared that she was suffering ill effects from an accident and called in Dr. Patrick Mills. Stella didn't speak English, so Mills could not get any information from her. He found Stella to be very ill, and, not liking the situation, left Balhatchett to deal with Stella's care alone. It was then that Balhatchett called in Dr. G. A. Stetler, who evidently recognized that he was dealing with an abortion case, and that a second surgery was necessary. One of the doctors performed it. The next day somebody asked a nurse, Jeannette Houston, to provide nursing care. She hadn't been told before arriving that this was an abortion case. She din't want to stay but did anyway, caring for Stella until her admission to the hospital on July 29. There, Dr. Maximillian Meinhard (hospital owner and/or head of surgery, specializing in ear, nose, and throat disorders), declared that Stella was suffering from pneumonia and handed her off to Dr. Charles W. Clark, who, not having been given a medical history also diagnosed Stella with pneumonia. She died on September 23. Stella was to be buried as a pneumonia victim, but Dr. Springer, coroner, had herd vague rumors and decided to perform an autopsy. Concluding that Stella had actually died from a septic abortion, he set an inquest date of August 27 in order to have time to gather evidence. Meinhart had been involved with abortion-related trouble before. In September of 1912, the body of Anna Rice was taken from his home to an undertaking establishment. He told the undertaker, E. I. Harty, that Anna had died of pneumonia. Harty notified the coroner, An inquest was held and the coroner's jury concluded that Anna had died from a botched abortion. 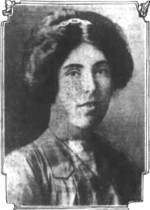 Menhardt was implicated in 1917 in the abortion death of Emma Melvin. "Barbara" is one of the women Life Dynamics identifies on their "Blackmun Wall" as having been killed by a legal abortion. Barbara was 35 years old when she traveled from Michigan to New York for a safe and legal abortion in 1971, taking advantage of New York's enlightened abortion law. She was 20 weeks pregnant. The doctor chose a saline abortion, which works by injecting a strong sterile salt solution into the amniotic fluid. As the fetus swallows and inhales the solution, it experiences massive internal hemorrhaging. Once the fetus dies, the woman goes into labor. Within 24 hours of being injected with saline for the abortion, she went into convulsions, then her heart stopped. Efforts to save her failed. She died on September 23, 1971, leaving behind five children. The autopsy could find no anatomical cause of death. The widower of a Wisconsin teacher killed in a safe, legal abortion has filed suit against the hospital training the resident who did the procedure. Linda Boom, age 35, went to Sinai Samaritan Medical Center in Milwaukee for an abortion on September 21, 1995. Linda and her husband, Dennis Boom, had married in 1993 and planned to start a family. Linda learned that she was pregnant in June of 1995, but in September elected abortion because the fetus had been diagnosed with Down Syndrome. Linda's aunt had Down Syndrome, which Linda believed meant "no life." Fourth-year resident Karen S. Watson administered an amnioinfusion. Linda reported pain and said she was "burning up all over." This is consistent with what a woman might experience during a botched saline abortion. Watson's supervising physician, Daniel Gilman, injected more chemicals into Linda's uterus. Dennis Boom's attorney, Patrick Dunphy, said that the two injections caused the heart damage that killed Linda 36 hours after the first injection. Watson did not use ultrasound to guide the needle injecting the poison into Linda, and apparently she injected the chemicals directly into Linda's bloodstream instead of into the amniotic sac. The defense, of course, says that there was no negligence. Also, the hospital says that Gilman is responsible for Linda's death, because he performed the second injection and was supervising Watson. Gilman can't be named in the suit because the statute of limitations expired before Linda's husband filed. News coverage of the case does not indicate why Watson and Gilman chose the antiquated instillation technique for Linda's abortion. Since the late 1960s, nations such as Sweden, Japan, and the Soviet Union had abandoned instillation abortions as being far too dangerous for the mother. US abortionists began abandoning the technique in the mid-1980s.